A tropical disturbance appears to be gaining a spin in the central Atlantic. It is hard to tell if the spin is low or mid level at this time, but it appears to be low level. In this case a tropical depression may be classified soon. As of 9 am edt the tropical disturbance was centered near 15.0 N / 40.0 W or roughly 1500 miles from the northern Leeward Islands. It is moving west at about 15 mph. Top sustained winds estimated at 25 mph. Pressure estimated at 1011 mb. Forecasts have been developing this wave into a significant tropical cyclone for several days now. They take it near the northern Caribbean to near Florida by the middle to later part of next week. Extended forecasts can have large errors and need to be viewed with caution. Overall, the appearance of the tropical disturbance has changed little from yesterday. Only a weak assemblance of a surface low is apparent. My estimate of 13 degrees north is not a southward movement from yesterday. It is a re-estimation of where the surface low is forming. This is very significant since the low is much more likely to move into the Caribbean now and possibly into the Gulf of Mexico. As of 8 am edt the tropical disturbance was centered near 13.0 N / 47.0 W or roughly 800 miles east of Barbados It is moving west at about 15-20 mph. Top sustained winds are estimated at 25 mph. Pressure is estimated at 1011 mb. Forecasts have been developing this wave into a significant tropical cyclone for several days now. They take it near the northern Caribbean to near Florida by late next week. Extended forecasts can have large errors and need to be viewed with caution. 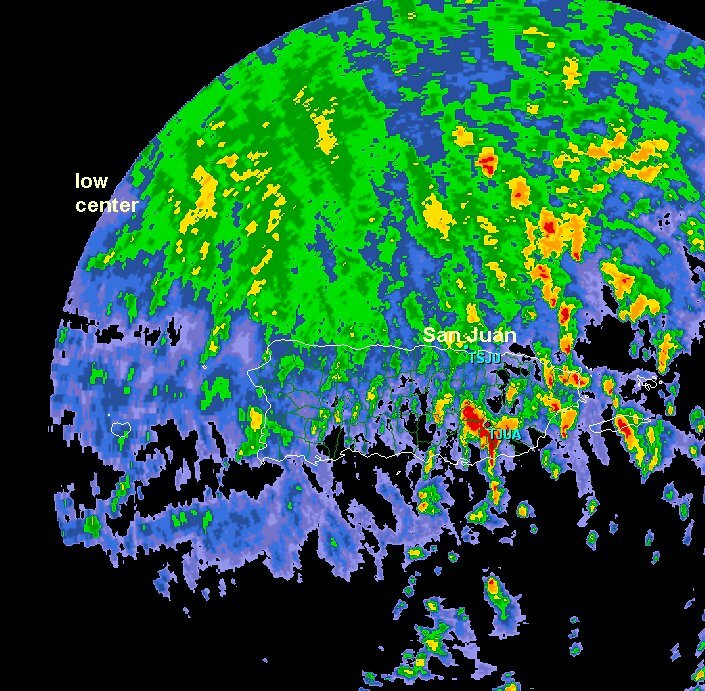 Deep convection is becoming more concentrated near the center of circulation of the tropical disturbance. It appears that a mid level center is under the thunderstorm mass and the low level circulation is in progress of forming. As of 5 pm edt the tropical disturbance was centered near 14.5 N / 51.5 W or roughly 700 miles east of the southern Leewards It is moving wnw at about 15-20 mph. Top sustained winds are estimated at 25 mph. Pressure is estimated at 1010 mb. The strong tropical disturbance still has not quite reached depression status yet. Visible satellite imagery doesn't conclusively show a closed low level circulation. Deep convection continues to build and a surface low is likely to form today. As of 9 am edt the tropical disturbance was centered near 16.0 N / 55.0 W or roughly 400 miles east of the Leewards It is moving wnw at about 15-20 mph. Top sustained winds are estimated at 25 mph. Pressure is estimated at 1007 mb. It appears that from visible satellite imagery this afternoon that a surface circulation has formed east of the Leewards. Deep convection continues to build near the circulation center. This will allow for further organization and strengthening. As of 5 pm edt the unofficial tropical depression was centered near 16.3 N / 58.8 W or roughly 220 miles ese of Antigua. It is moving wnw at about 15-20 mph. Top sustained winds are estimated at 30 mph. Pressure is estimated at 1006 mb. Forecasts have been developing this wave into a significant tropical cyclone for several days now. They take it though the northern Caribbean - possibly over all of the northern Antilles to near Florida by Thursday or early Friday. If this tropical cyclone does pass over many of the islands it will inhibit strengthening. Once it moves north of the Caribbean additional strengthening is likely if it does not pass directly over the mainland of Florida. Interests in the Leewards, northern Caribbean, Bahamas, Turks and Caicos, and Florida / eastern Gulf / southeastern U.S. should follow this tropical cyclone closely. So, from not being a depression straight to a 50 mph tropical storm? NHC upgrades on the most recent recon a short while ago. Pressure at 1007 mb. The wind speed was estimated at 29 knots surface and 53 knots flight level. IMO with a 1007 mb pressure the surface wind is probably 40 or 45 mph. Irene is in a strengthening phase. It is interesting to note that the official NHC estimate of 50 mph has not changed since Irene was named over six hours ago. Satellite imagery shows increased organization since then. A recon will be in the area in a few hours wtih an official estimate. Irene is a little north of the official hurricane center track and a little stronger than NHC is forecasting. As of 3 am edt /ast Irene was centered near 16.3 N / 60.5 W or about 100 miles ese of Antigua. It is moving wnw at 22 mph. Top sustained winds are estimated at 55 mph (NHC 50 mph last advisory). Pressure is estimated at 1002 mb (NHC 1006 mb last advisory). Forecasts models are becoming more consistent. They take it though the northern Caribbean - possibly over all of the northern Antilles to near south Florida by Thursday. If this tropical cyclone does pass over many of the islands it will inhibit strengthening. Once it moves north of the Caribbean additional strengthening is likely if it does not pass directly over the mainland of Florida. None of the models can accurately "know" exactly how strong Irene will be when it is near south Florida at this point. It will be heavily dependent on how much land is encountered, especially Hispaniola. 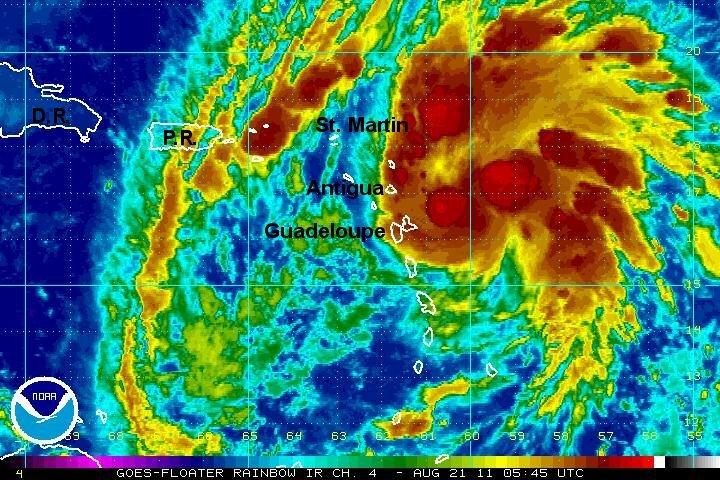 Irene is on a steady course toward Puerto Rico. It should pass over or just south of St. Croix late today and make landfall on the southcentral coast of Puerto Rico tonight. Recent reports from the northeastern Leewards show that Saint Eustatius had a gust to 54 mph and St. Martin heavy rain and a gust to 43 mph. 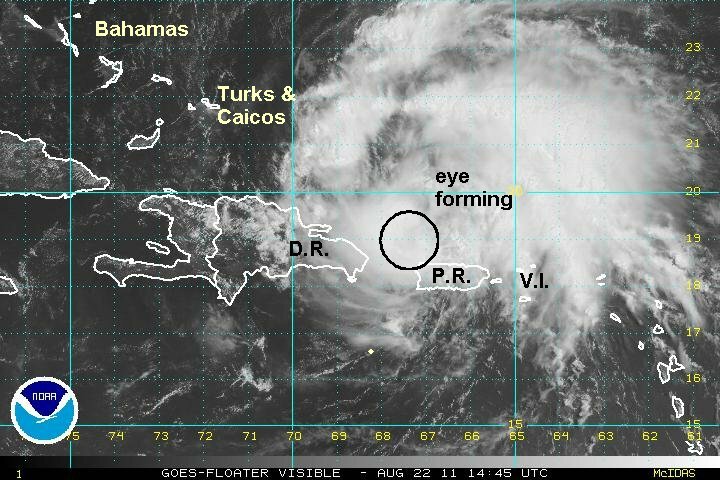 As of 12 pm (noon) edt / ast Irene was centered near 17.1 N / 63.4 W or about 215 miles east southeast of Ponce, Puerto Rico. It is moving wnw at 20 mph. Top sustained winds are estimated at 50 mph (NHC 50 mph last advisory). Pressure is estimated at 1005 mb. Forecasts models are becoming more consistent. They take Irene through the northern Caribbean - possibly over all of the northern Antilles to near south Florida by Thursday. If this tropical cyclone does pass over many of the islands it will inhibit strengthening. Once it moves north of the Caribbean additional strengthening is likely if it does not pass directly over the mainland of Florida. None of the models can accurately "know" exactly how strong Irene will be when it is near south Florida at this point. It will be heavyly dependent on how much land is encountered, especially Hispaniola. It is still too early to know if Irene will move west / over east of Florida as it turns north. Recent reports show St. thomas with rain and gusting to 45 mph, St. Croix - rain, gusting to 24 mph, St. Martin - rain, gusting to 40 mph. 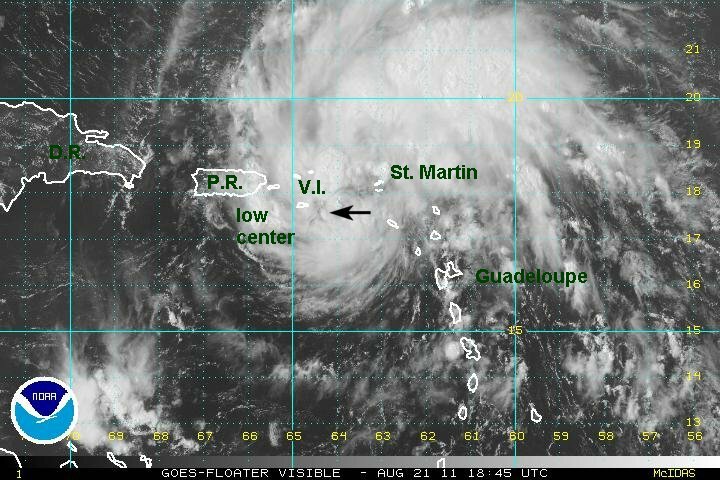 The center of the low will pass very close to St. Croix during the few hours. The worst of the weather is north of the Caribbean. The main change concerning irene is the forecast track which is detailed below. 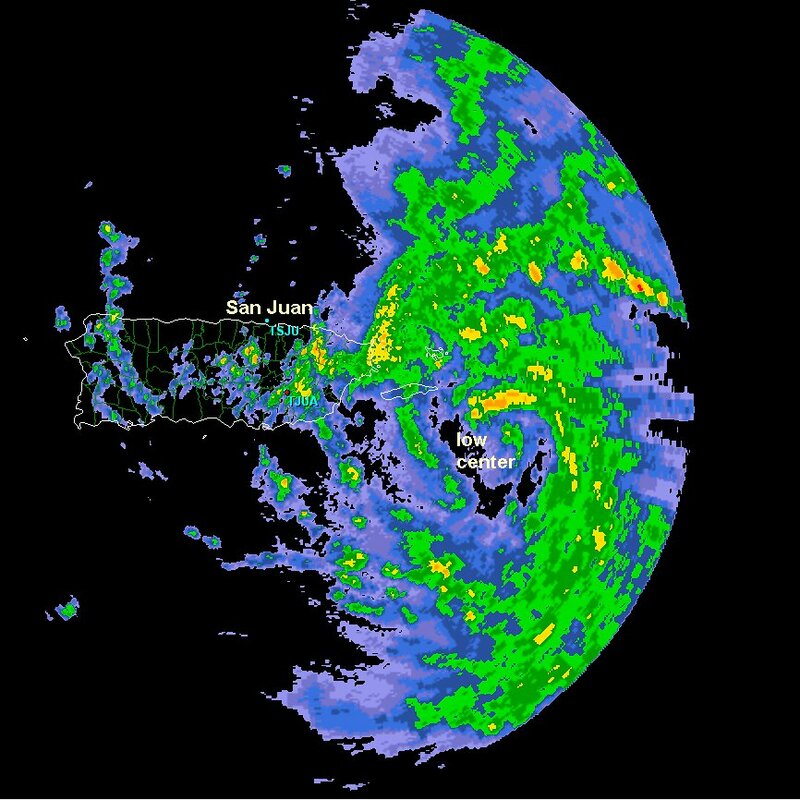 As of 4 pm edt / ast Irene was centered near 17.6 N / 63.9 W or about 150 miles east southeast of Ponce, Puerto Rico / 35 east southeast of St. Croix. It is moving wnw at 18 mph. Top sustained winds are estimated at 50 mph (NHC 50 mph last advisory). Pressure is estimated at 999 mb. Just after seeing the forecast models become more consistent, they now have changed. It appears that the weakeness in the ridge will allow Irene to turn north a little sooner. The turn may be just east of the Florida east coast into the middle Bahamas. This trend is disconcerting. Although this is good news for Florida, staying over the water will allow for additional significant strengthening to occur. As of now the forecast takes Irene through the Bahamas late wednesday night into thursday. It will move north toward the south carolina coast by early saturday. Interests in the northern Caribbean, Bahamas, Turks and Caicos, and U.S. coast Florida to North Carolina should follow this tropical cyclone closely. Irene passed directly over St. Croix a short while ago. The strongest recorded gust was 59 mph. Roosevelt Roads, Puerto Rico recently had a gust to 47 mph. Irene will make landfall in southeast Puerto Rico overnight tonight and will likely be just under hurricane strength at landfall. 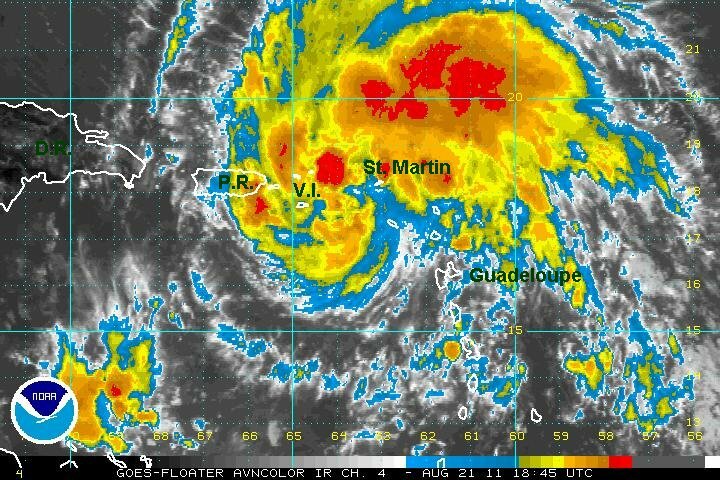 As of 8 pm edt / ast Irene was centered near 17.8 N / 64.9 W or about 90 miles southeast of San Juan, Puerto Rico / 10 miles nw of St. Croix. It is moving wnw at 18 mph. Top sustained winds are estimated at 60 mph (NHC 60 mph last advisory). Pressure is estimated at 995 mb. Forecast models take Irene over Puerto Rico then the Dominican Republic before moving offshore into the southern Bahamas by Wednesday. Irene will weaken over land and restrengthen as it emerges back over water. 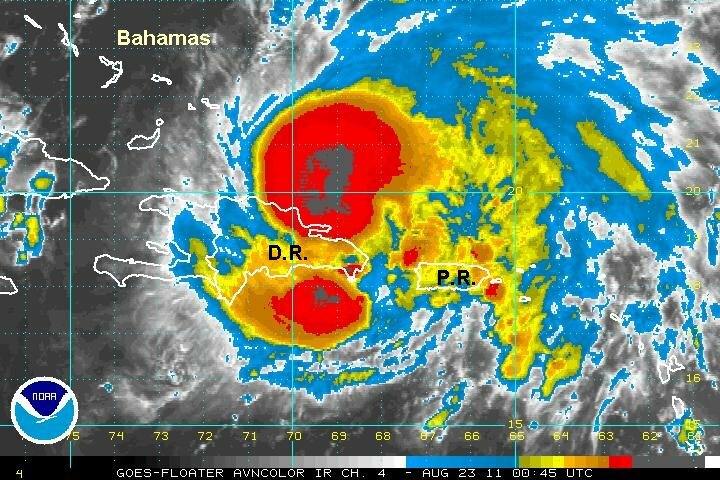 The more reliable forecasts take Irene through the central and northern Bahamas into thursday. It then moves north toward the Southeast coast around South Carolina by Saturday. Keep in mind that long range tracks can vary by time and location. 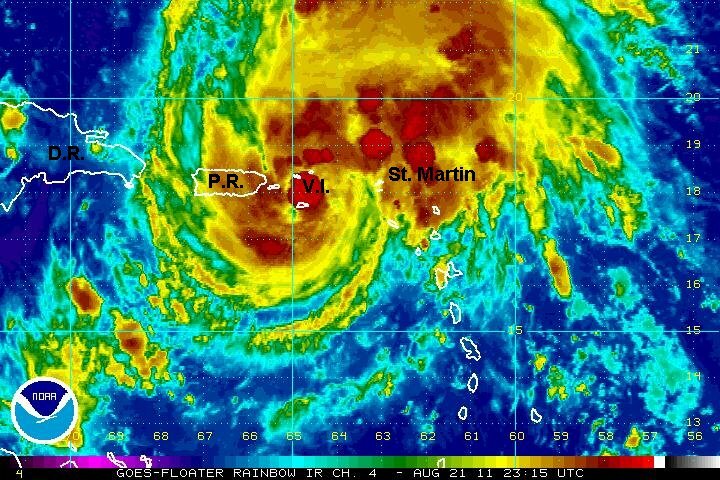 Irene is gradually strengthening and passing over Puerto Rico did little to damage the overall circulation. There is good news that the worst of Irene will miss Haiti. the bad news is that models have shifted east again leading to a "nightmare scenario" where Irene may crawl up the eastern seaboard as a hurricane. A detailed look at the forecast follows. As of 7 am edt / ast Irene was centered near 18.8 N / 68.8 W or about 55 miles wnw of San Juan, Puerto Rico. It is moving wnw at 14 mph. Top sustained winds are estimated at 75 mph (NHC 75 mph last advisory). Pressure is estimated at 987 mb. Forecast models have shifted eastward again. This is a very bad scenario! This means that Irene will not weaken much. It is expected into the southern Bahamas and Turks and Caicos Tuesday. It will continue this course gradually turning east of Florida and north along the eastern Seaboard from South Carolina to New England. This is a bad scenario if the hurricane stays just offshore and moves northward along the coast! Hopefully the model trends will continue to the east. If the hurricane is even 100 miles farther east it will make a huge difference in the damage potential on the coast. Keep in mind that long range tracks can vary by time and location. Interests in the northern Caribbean, Bahamas, Turks and Caicos, and U.S. coast Florida to new England should follow this tropical cyclone closely. Irene is moving away from Puerto Rico and the low center will be approaching the northeast coast of the Dominican Republic by late this afternoon. I think that Irene is not quite an 80 mph hurricane yet. The pressure is still relatively high for that wind speed. San Juan saw a little less than 3 inches of rain from Irene and tropical storm force wind gusts. Weather in the Virgin Islands is starting to improve and Puerto Rico by tonight. It's possible that Irene will undergo a rapid strengthening phase as it pulls away from Hispaniola. This will be watched for carefully. As of 12 pm edt / ast Irene was centered near 19.2 N / 67.6 W or about 55 miles ne of Punta Cana, Dominican Republic. It is moving wnw at 14 mph. Top sustained winds are estimated at 75 mph (NHC 80 mph last advisory). Pressure is estimated at 988 mb. Irene is not expected to weaken much as Hispaniola now appears to only have had a minimal effect on the hurricane's structure. It is expected into the southern Bahamas and Turks and Caicos Tuesday. It will continue this course gradually turning east of Florida and north along the eastern Seaboard from South Carolina to New England. This is a bad scenario if the hurricane stays just offshore and moves northward along the coast! Hopefully the model trends will continue to the east. If the hurricane is even 100 miles farther east it will make a huge difference in the damage potential on the coast. Keep in mind that long range tracks can vary by time and location. New models are coming in and a new update will be posted later this afternoon. Puerto Rico now appears to have had more of an impact on Irene's structure than I originally thought. Recon aircraft has shown that pressure has changed little. The island of Hispaniola is also blocking the low level inflow from the south. Irene is still expected to strengthen soon as it pulls away from the islands of Puerto Rico and Hispaniiola. As of 5 pm edt / ast Irene was centered near 19.5 N / 68.6 W or about 65 miles nnw of Punta Cana, Dominican Republic / 215 miles se of Grand Turk. It is moving wnw at 13 mph. Top sustained winds are estimated at 75 mph (NHC 80 mph last advisory). Pressure is estimated at 988 mb. 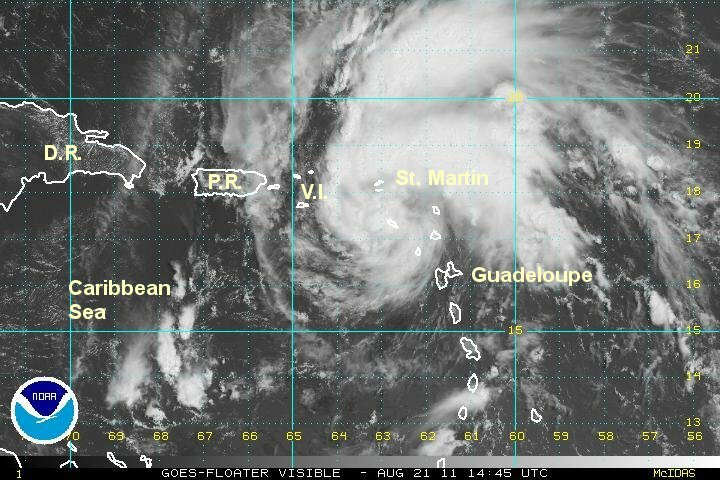 Irene is headed generally west northwest toward the southern Bahamas and Turks and Caicos late Tuesday. It is projected into the central Bahamas Wednesday where it is expected to make an abrupt north turn late in the day. Thursday the forecasts take it into northern Bahamas. Friday it is projected north of the Bahamas heading toward the Southeast U.S. This is where the models differ. Some take it into the coast of NC Saturday where others have it moving up the eastern seaboard hugging the coast. This difference will make a huge difference in damage potential up the coast. Neither scenario looks good. Remember, long renge forecasts can have large errors in time and location. Irene has started intensifying as it is north of the Dominican Republic. A large burst of deep convection is near the low center and another band south of the Dominican Republic. Hispaniola is still in danger of serious rainfall. Further strengthening is likely as the low level inflow becomes less restricted as Irene moves into the Bahamas. I am estimating 90 mph - 10 mph lower than the official NHC estimate due to a still relatively high pressure and recon surface wind estimate of 82 mph. In fact the recon found a 123 mph wind but that was aloft. I would guess NHC went with the interpolation of 100 mph from the 123 mph measured at 10 k feet. As of 10 pm edt / ast Irene was centered near 19.7 N / 68.8 W or about 190 miles se of Grand Turk. It is moving wnw at 13 mph. Top sustained winds are estimated at 90 mph (NHC 100 mph last advisory). Pressure is estimated at 981 mb. 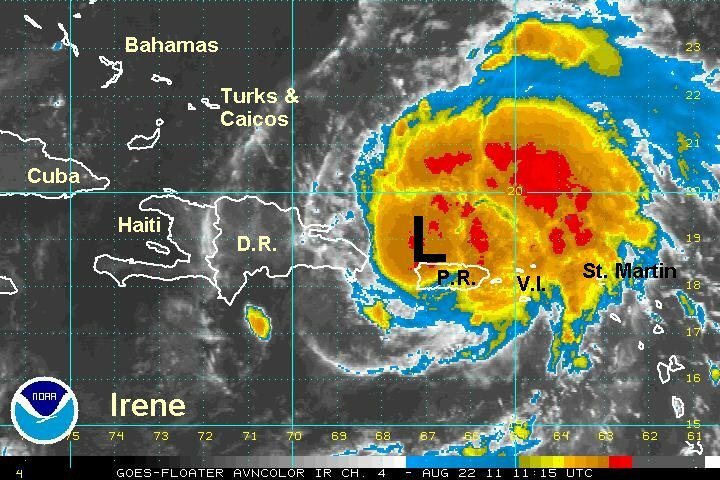 Irene is headed generally west northwest toward the southern Bahamas and Turks and Caicos late Tuesday. It is projected into the central Bahamas Wednesday where it is expected to make an abrupt north turn late in the day. Thursday the forecasts take it into northern Bahamas. Friday it is projected north of the Bahamas heading toward the Southeast U.S. This is where the models differ. Some take it into the coast of NC Saturday where others have it moving up the eastern seaboard hugging the coast. This difference will make a huge difference in damage potential up the coast. Neither scenario looks good. Remember, long range forecasts can have large errors in time and location. Interests in Cuba, Hispaniola, Bahamas, Turks and Caicos, and U.S. coast Florida to new England should follow this tropical cyclone closely. 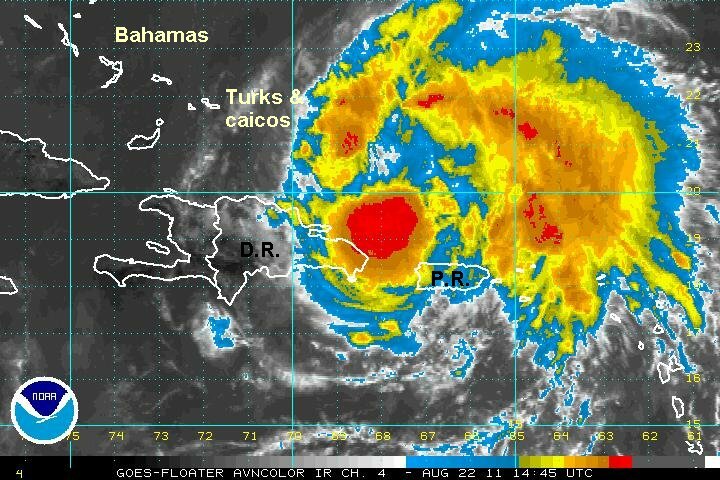 Irene is moving just north of the island of Hispaniola - The Dominican Republic and Haiti. Puerto Plata on the north coast reported a steady wind of 58 mph a few hours ago before stopped reporting. Two distinct zones of convection have set up. 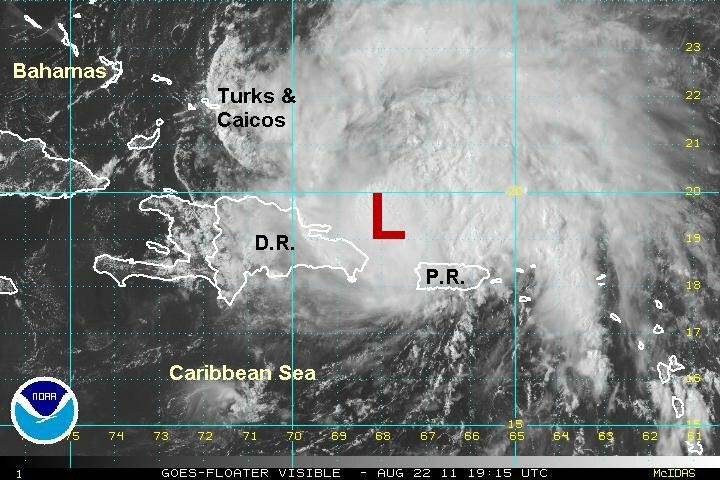 The first is over and to the west of the low center, the other remains on the other side of the Dominican Republic to the south. It is apparent that the mountains of Hispaniola are disrupting the intensification of Irene by entraining some dry air into the circulation. 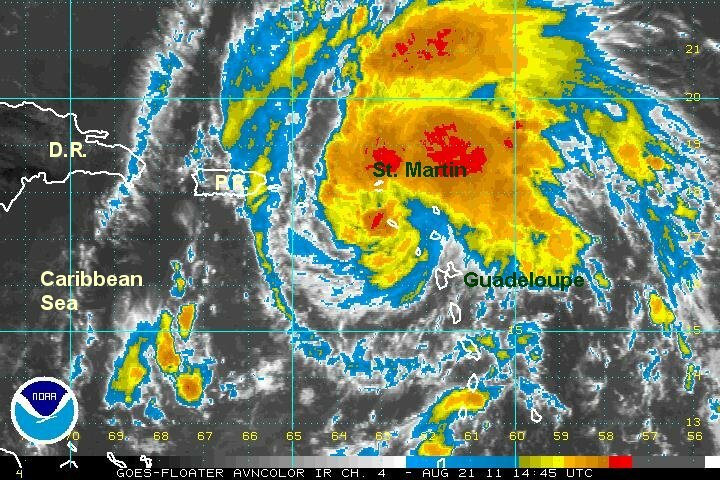 As Irene pulls away from Haiti later today additional strengthening is likely. After last evening's burst of intense convection, it doesn't appear that too much strengthening has occured. An eye is now becoming visible as a warm spot on the IR satellite imagery and should be more easily seen on the visible satellite later this morning. As of 5 am edt / ast Irene was centered near 20.3 N / 70.1 W or about 105 miles se of Grand Turk. It is moving wnw at 12 mph. Top sustained winds are estimated at 95 mph (NHC 100 mph last advisory). Pressure is estimated at 978 mb. Irene is headed generally west northwest into the southern Bahamas and Turks and Caicos later today. It is projected into the central Bahamas Wednesday where it is expected to make an abrupt north turn late in the day. Thursday the forecasts take it into the northern Bahamas. Friday it is projected north of the Bahamas heading toward the Southeast U.S. Irene is forecast near the central coast of North Carolina Saturday and will either move inland at this location or hug the coast northward. Remember, long range forecasts can have large errors in time and location.